Elizabethe Holland Durando When kidney cancer is diagnosed early — before it spreads — 80 percent of patients survive. But early diagnosis is a challenge. Now, Washington University School of Medicine researchers Evan D. Kharasch, MD, PhD (left) and Jeremiah J. Morrissey, PhD, have developed a noninvasive method to screen for kidney cancer by measuring the presence of proteins in the urine. Now, researchers at Washington University School of Medicine in St. Louis have developed a noninvasive method to screen for kidney cancer that involves measuring the presence of proteins in the urine. The findings are reported March 19 in the journal JAMA Oncology. The researchers found that the protein biomarkers were more than 95 percent accurate in identifying early-stage kidney cancers. In addition, there were no false positives caused by non-cancerous kidney disease. “These biomarkers are very sensitive and specific to kidney cancer,” said senior author Evan D. Kharasch, MD, PhD. Kidney cancer is the seventh most common cancer in men and the 10th most common in women, affecting about 65,000 people each year in the United States. About 14,000 patients die of the disease annually. Like most cancers, kidney tumors are easier to treat when diagnosed early. But symptoms of the disease, such as blood in the urine and abdominal pain, often don’t develop until later, making early diagnosis difficult. When kidney cancer isn’t discovered until after it has spread, more than 80 percent of patients die within five years. With researchers from the Siteman Cancer Center, the Mallinckrodt Institute of Radiology and the Division of Urologic Surgery, Kharasch and principal investigator Jeremiah J. Morrissey, PhD, professor of anesthesiology, analyzed urine samples from 720 patients at Barnes-Jewish Hospital who were about to undergo abdominal CT scans for reasons unrelated to a suspicion of kidney cancer. Results of the scans let the investigators determine whether or not patients had kidney cancer. As a comparison, they also analyzed samples from 80 healthy people and 19 patients previously diagnosed with kidney cancer. The researchers measured levels of two proteins in the urine — aquaporin-1 (AQP1) and perlipin-2 (PLIN2). None of the healthy people had elevated levels of either protein, but patients with kidney cancer had elevated levels of both proteins. In addition, three of the 720 patients who had abdominal CT scans also had elevated levels of both proteins. Two of those patients were diagnosed subsequently with kidney cancer, and the third patient died from other causes before a diagnosis could be made. Even when patients had other types of non-cancerous kidney disease, levels of the two proteins in the urine were not elevated and did not suggest the presence of cancer. Not all kidney masses found by CT scans turn out to be cancerous, he said. In fact, about 15 percent are not malignant. 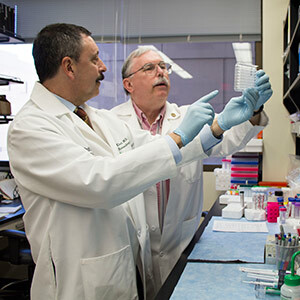 Kharasch and Morrissey are working to develop an easy-to-use screening test for kidney cancer, much like mammograms, colonoscopies or other tests designed to identify cancer at early, more treatable stages before patients have symptoms. Funded by the Barnes-Jewish Hospital Cancer Frontier Fund and The Department of Anesthesiology at Washington University School of Medicine in St. Louis, with additional support from the Bear Cub Fund of Washington University, Barnes-Jewish Hospital Foundation and Washington University Institute of Clinical and Translational Science, with additional funding from the National Cancer Institute (NCI) of the National Institutes of Health (NIH). NIH grant numbers R01CA141521 and UL1 TR000448. Morrissey JJ, Mellnick VM, Luo J, Siegel MJ, Figenshau RS, Bhayani S, Kharasch ED. Evaluation of urine aquaporin 1 and perilipin 2 concentrations as biomarkers to screen for renal cell carcinoma. JAMA Oncology, published online March 19, 2015.